I’ve been an avid weather watcher since I was 14. In 1980, farm families across the South actually prayed for a hurricane to hit the Gulf of Mexico. Farms devastated by two straight weeks of 100° degree temperatures were in desperate need of rain. Though it never came, we watched the weather daily in hopes that a storm would blow our way and bring rain to salvage a crop. Ever since, when hurricanes like Isaac come in our direction, it reminds me of that hard time for my family and others. So it was with nostalgic interest that I watched The Weather Channel‘s Jim Cantore during his live broadcasts in New Orleans yesterday. 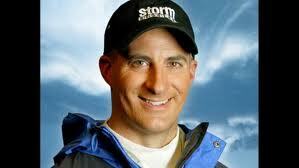 Cantore is the consummate weather journalist. In the brunt of the storm, Cantore was broadcasting live when the conditions became almost too much to bear. He didn’t run, he didn’t lose his composure. Cantore simply took a Tebow. On live TV, for one moment he said, “I’m gonna ride this one out, guys.” Then he came right back. Cantore’s a real pro. I hope I can chase a tornado one day and check the bucket list. He’s the man. Nice to hear someone else is interested in the weather. My husband grown daughter is in Covington, LA with no lights right now.